Humpback Whale Saves Seal from Orcas! There are plenty of stories of dolphins saving humans. Authentic tales of dolphins assisting swimmers in distress are numerous. On the opposite side of popular mythology is the killer whale, the largest of all dolphins. Orcas are often erroneously depicted as dangerous to humans. But transient type killer whales do hunt other mammals, if not people. They have been reported eating a variety of seals, sea lions, smaller dolphins, porpoises, and even the largest whale in the world – the blue whale. In the San Juan Islands of Washington the transient orca whales most frequently eat harbor seals. Orcas are the star of our sea kayaking tours in the San Juan Islands of Washington. Earlier this year, scientists Robert L Pitman and John W Durban sailed to Antarctica in search of killer whales. They were looking for a possible new species of killer whale, known to hunt Weddell seals by washing them off ice floes with their wake. They found some orca whales attempting this technique until interrupted by a pod of humpback whales. Pitman and Durban watched as one seal, swept into the water by the orcas, swam towards the humpback whales. As the killer whales moved in, the plucky pinniped leapt on to the vast ribbed belly of a humpback, and nestled in the animal’s armpit. 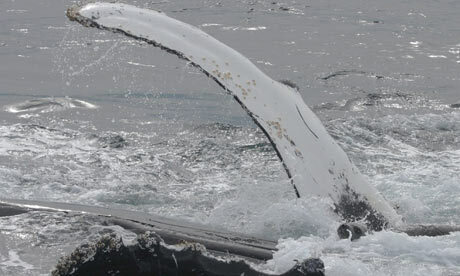 When a wave threatened to return the seal to danger, the humpback used its massive 15-foot flipper to nudge it back on. “Moments later the seal scrambled off and swam to the safety of a nearby ice floe,” wrote the scientists. They believe the seal triggered a maternal defense mechanism in the humpbacks. Link to this story in the The Guardian. Watch Killer Whales Hunt on a San Juan Islands Kayaking Tour this Summer!